I may never have been to a festival... and may actually never go (me and camping do NOT mix well) but I love festival style. I love the hippy, lazy care free fashion and the emphasis on florals. I will always love florals. So, I popped together a little wishlist outfit - practical yet o so perdy. From others tales a festival isn't complete without a little rain - so waterproof jackets are needed. The colour of this coat makes it a little different and adds an element of chic, and really goes with this cute little pinafore. 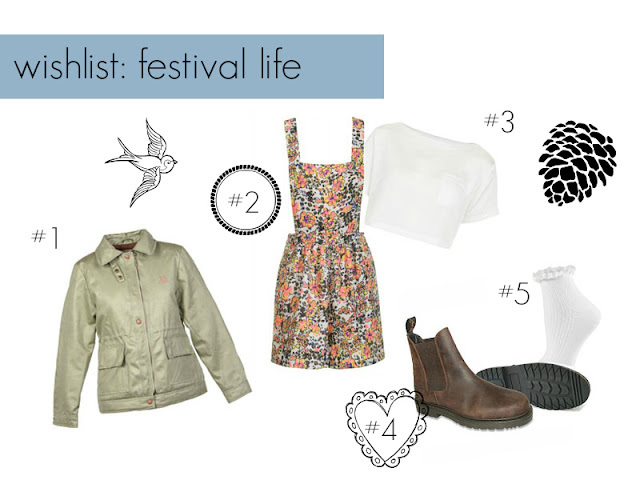 Pinafores are everywhere at the moment, so why not a festival? It's practical and oh my god oh so pretty. I love the pattern and the colours are different for me, and yet I want them on my body - like now please! Again, crop tops are everywhere you look, and although my belly isn't exactly crop ready, its the perfect under top for a pinafore. A plain white crop top is definitely one of my sure fire hits for this summer so stock up! I've wanted a pair of boots like this for ages... what seems like forever. They look super comfortable yet stylish and incredibly practical. These seem like they would last forever. These cute ankle socks go so well with a pinafore - each remind me of a seriously cool school outfit. Popped together with these ankle boots and you have a super cute effect. Tempting to buy this outfit and pretend I'm at a festival... Dance in my garden to my ipod in the rain maybe? This sounds like a great idea; maybe add some friends? What's your perfect festival outfit? Would you buy any of these?